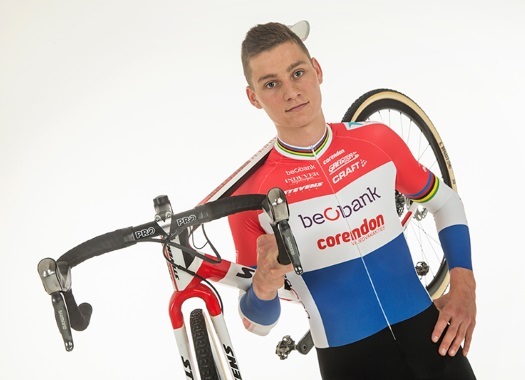 Mathieu van der Poel (Corendon-Circus) has taken the silver medal at the European Championships Road Race. The Dutchman crossed the finish line centimetres away from European Champion Matteo Trentin. The calendar year has been outstanding for the Dutch talent. He has taken the victories at the Championships of The Netherlands in three disciplines: Cyclocross, road and mountain bike. The current European Champion of Cyclocross wanted to add the Road European Championships to the season, but it was not possible. The rider was part of the last breakaway of the day and arrived in the final metres in a good position, but Matteo Trentin's sprint abilities left him on the second position of the final podium. "I think the best has won," said the rider to Dutch broadcaster NOS. "I chose the right wheel. I had to hold the sprint for a moment, but even without I would not have caught up with him. "I have to be satisfied with silver. It was a very tough course. It was not quiet even for a moment. The race was open from the start."